She gazes at Kafka on the shore. It is morning. You breathe in the scent of the sea. The sun's rays pour into your being, touching the deepest depths of your soul. There is soft music playing in the background. You feel the warm breeze kissing your face with the faintest of whispers. And then you open your eyes. You are on the ground, smelling damp earth, while your shirt has a butterfly-shaped stain right in the middle of your chest, next to your heart. You don't remember what happened before you fainted, but at least you know your name, or what you think your name is. At the very least, you remember the boy named Crow. There is a kind of mystery that not all of us can fathom. We seek answers to questions we cannot phrase, or maybe look for persons we know are strangers. We run from what angers us, pretending we know best; we pretend to not know because it is uncomfortable to know. It is mystical and dreadful at the same time. After all, who really knows what's real? This book seeks to understand, and yet confuses with its theories. Elements of magic and disbelief lie in these pages, these pages that hold the stories of different peoples of seemingly different times. There are quotes, books, and records; there is war, afterlife, and sand. It is linear while being nonlinear; it is allegorical while remaining realistic yet superstitious. It challenges your perception, while confirming your reality. It has a number of dark overtones, while it basks in the warm sunshine. The line that delineates what is true from what is not is not ever present, but you know it happened even if you can't believe it. The book is relatively easy to read, but also not so. It can be difficult to accept the characters here, all splayed out with their dirt sullying the pages. Still, they can be pristine, and enjoyable. Pick up this book to read between its lines. There is a story behind the story, and words behind the words. It is ok to be confused, because even the cat is confused. Accept that what will happen will happen, and don't forget the hue of blue of that beautiful shoreline. Search for the entrance stone, and more. 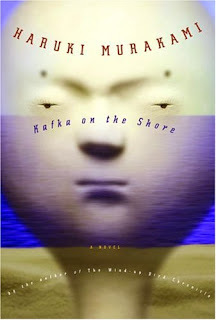 at Kafka on the shore. Murakami is one of my favorite writers. If you really want a meta journey, check out his homage to 1984, the huge opus 1Q84. Hi Mike! I'll definitely put 1Q84 on my to-read list. I've enjoyed Murakami, and will definitely check more of his works. Thanks for the comment!